High 5 Moment: November 2017 Statistics! Hello, High 5-ers! December is here and the holidays are right around the corner! Before shopping for presents and baking cookies takes over our time, let us look back and cherish the most thankful time of the year: November! While we enjoyed playing Gobblers Gone Wild as we stuffed our faces with turkey and mashed potatoes, High 5 Casino released 5 new games with weekly themed XP Events, as well as High-5 favorite Raffles! New games celebrating their one monthiversary include Jokers’ Riches, Russian Wolf, Triple Turducken, Golden Gladiator, and Eagles’ Flight! From our Spin of Thrones XP to the Rise to Victory XP, players were able to level up their Game Level 2X faster in select slots celebrating the new releases! November is a time to give thanks; we invited High 5-ers to enter our H5C’s Give Thanks Contest for a chance to win 200k Coins! With over 1,300 entries, 100 lucky players were selected and awarded FREE COINS! To show our thanks to all of our dedicated players, in addition to daily free coin giveaways’ on our Facebook Fan Page and Facebook Notifications, we offered a 3XP Player Level to Diamond and Emerald VIPs and a 2XP Player Level to Sapphire, Ruby, and Platinum VIPS! With these events, players were able to level up their Player Level 2 or 3 times FASTER! With all fun-tastic events that November brought, High 5-ers spun the reels over 2 BILLION times, winning 73 TRILLION coins collectively! Could you imagine having 73 trillion coins in your bankroll? What game would you play first? 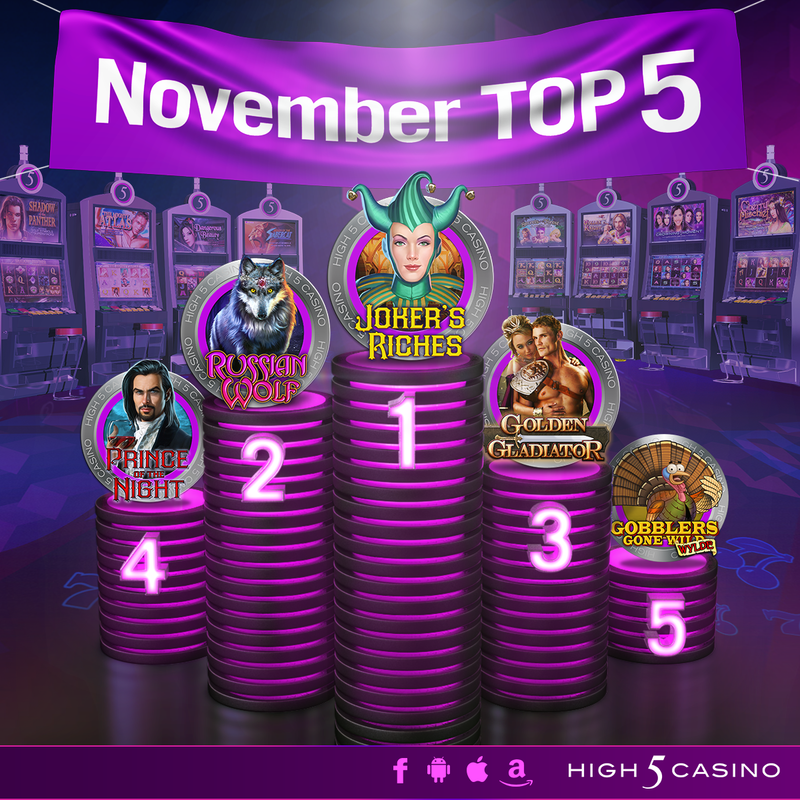 Top 5 most played games for November: Jokers’ Riches, Russian Wolf, Golden Gladiator, Prince of the Night, and Gobblers Gone Wild! Which game gave you your High 5 Moment in November? Did you enter H5C’s Give Thanks Contest? Comment in the conversation bubble located on the top right corner of your screen and let us know! This entry was posted in game preview, Game Release, H5C Stats, High 5 Casino, High 5 Games, High 5 Moments, statistics, top games and tagged Android, App Store, Apple, Facebook, Free Games, Game Spotlight, Gobblers Gone Wild, Golden Gladiator, Google Play Store, H5C, High 5 Casino, High 5 Casino Mobile, High 5 Games, iOS, iPad, iPads, iPhone, iPhones, Joker's Riches, mobile gaming, Prince of the Night, Russian Wolf, Shake the Sky Casino, Shake the Sky Casino Mobile, slots, social gaming, statistics by hoothigh5. Bookmark the permalink. Can someone tell me why my treasure chest is “stuck” at around 500K? When the feature first started, it would go up to the millions based on what I spun. I really wish the tournament games would change at least once a month. I use to play them all the time but I hate the ones that are there now and have been for several months. Hi Russell, We appreciate you taking the time to reach out and give us your feedback. We value you very much as a player and we will certainly forward your thoughts to our developers.